Up by 1 and it feels so good! #NHLJets goal from @markscheifele55 ! The @sixers opened the game on fire and buried 8 triples in the 1st quarter! Leave it to @BiggieFunke and Big Buff to assist!! KAT has hit 6 straight shots & is up to 14 points. 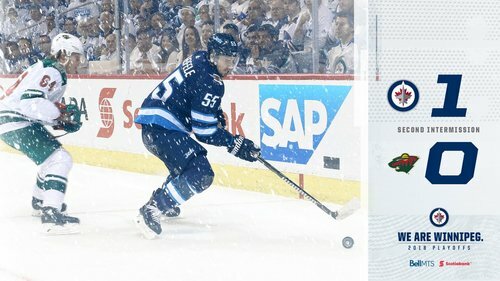 @markscheifele55 opens the scoring with a snipe of a PPG! 1-0 Jets 2:23 remains in the second. And #NHLJets convert. Scheifele from the slot off a one-timer. This crowd has been AMAZING!!!! Incredible atmosphere, they're into EVERY possession. Just AWESOME!!! @timberwolves lead @nuggets 44-37 on NBATV! #NHLJets back to the power play with 2:43 to go in the second. Prosser heading off for holding. Minnesota getting nabbed for a penalty with 2:43 to go in the second. Nate Prosser to the box. Jrue Holiday hits Ian Clark on the roll for the @PelicansNBA ! Dubnyk rebound kicks right out to Connor, but Dubnyk flashes the glove with a slick grab. Nuggets are formidable this season when leading after a qtr. They trail 29-26 after one in this one. @Timberwolves 29 | @nuggets 26 after Q1 in Minnesota! END OF 1Q: Wolves lead 29-26! Towns leads with 8 points. Gibson and Wiggins each with 6 points. Little cuts inside #mnwild 'D,' but Dubnyk gobbles up the backhand. PG13 with an early 13 PTS on 5 of 5 shooting! Puck pops out to Niederreiter alone in front, but he can't get off a quality shot. Dario Saric with the fake and finish! @sixers lead 25-10 in the 1st quarter on ESPN.